Kim Waters' voice conveys strength and directness and optimism. But it doesn't reveal her small stature or all the wearing months she's spent in the hospital with her 2 1/2-year-old son. LIVING WITH IT : Karsen Waters has many sometimes hundreds of seizures a day, his mom said started after he received his diphtheria, tetanus, and pertussis vaccination. # Two years ago, Kim took Karsen, the youngest of her three children, in for a standard diphtheria, tetanus, and pertussis vaccination. Within 10 hours, his four-month-old body seized for 35 minutes. The seizures remain a constant in his life. Without warning, his eyes will close and his head will start to nod rapidly. He has hundreds of seizures a day. While the U.S. Centers for Disease Control and Prevention lists seizures as one potential side effect of the DTaP shot affecting about one out of every 14,000 children who get it Karsen's doctors don't confirm any connection between the vaccination and his seizures. Yet after meeting other parents with similar experiences, statistics and medical opinions don't matter as much to Kim. "You don't go by stats anymore. You go by parents and what they tell you. I was shocked [by their stories]," she said. Because of what Kim believes happened to her son, she decided not to immunize her children anymore. And the Northern Santa Barbara County resident isn't alone in that choice. The percentage of Santa Barbara County parents who chose not to vaccinate their kindergartners as of October 2006 was just over 3 percent, roughly double the state average, according to the 2006 Kindergarten Assessment Results. In San Luis Obispo County, the percentage was just a hair under 3 percent. In other words, out of 2,069 SLO county kindergartners, 78 had a personal belief exemption from one or more immunizations. In 2005, the difference between SLO county and state percentages was even greater. So why are local parents choosing not to vaccinate their children? It's clear that there's no one answer to that question. The explanation lies partly in the tendency in post-modern life to question the scientific establishment. It lies partly in the power of anecdote. It lies partly in the dearth of deadly disease outbreaks in America. But it lies also in the disturbing link many parents have made between the timing of immunizations and the development of sicknesses in their children. Dr. Rex Stevens, a chiropractor at the California Wellness Center in San Luis Obispo, said one explanation may lie with the attitudes of local doctors. "There may be more medical doctors here who may be more willing to work with people who are questioning the vaccines," Stevens said. "Some places, pediatricians won't accept patients who are questioning. You can go to five different pediatricians and none of them will accept your child if you're questioning vaccinations." As Dr. James Tedford of Paterson and Tedford Pediatrics in Atascadero sees things, parents who opt out of immunizations are more concerned about the risks and side effects of vaccines than the vaccine-preventable diseases. "We're in a generation that has lived with the vaccinations and therefore not experienced the diseases," Tedford said, stressing the importance of immunizing. "I think that, as pediatricians, it is, as a preventative health-care procedure that we do for children, it is as important as any other preventative procedure that we do." Many health professionals, including county supervising public health nurse Debbie Jo Trinidade, stress that the diseases remain far more dangerous than the vaccinations. "To not have your child vaccinated is not a no-risk situation. You're giving your child another set of risks," Trinidade said. Some of the risks of exposing children to disease include disability, hospitalization, and death. But as the Centers for Disease Control and Prevention acknowledges in its information, on rare occasions vaccinations can have the same results. For some people, those anecdotal stories are more frightening than the cold comfort that may lie in government statistics supporting vaccine use. 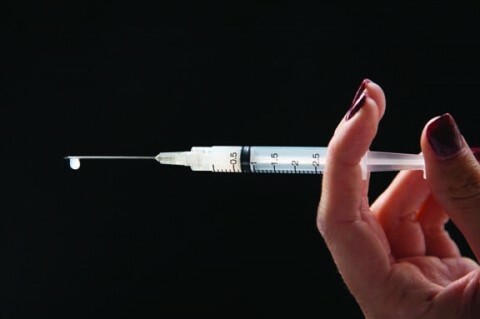 INJECTION QUESTION : San Luis Obispo County allows parents to opt out of vaccinating their children for reasons of personal belief, but local doctors stress that the potential for getting a disease outweighs the risk of any potential vaccination side effects. Diane Moorman is a grandmother whose gray hair betrays its former blonde color and whose fair skin is freckled with sunspots. But she gets a twinkle in her eyes when she talks about the research she's done into immunizations and pharmaceutical companies. The Los Osos woman is a member of the Virginia-based National Vaccine Information Center, which questions the safety of some vaccines and supports the right of parents to choose not to vaccinate. Moorman said she became interested in the role of vaccines after a family member reacted adversely to the live oral polio vaccine, and the incident eventually resulted in a multi-million-dollar settlement through the National Vaccine Injury Compensation Program, set up by the government in 1988 to provide compensation for people injured by vaccines, without placing blame on any parties. Now, only the inactivated polio vaccine is used. Unlike the live version, the inactivated version doesn't cause polio or any other serious problems, according to the CDC. Sometimes when Moorman talks about the subject of immunizations the edges of her mouth start to tremble with emotion and her eyes water behind her glasses. She has an armful of articles on the U.S. Food and Drug Administration, conflicts of interest involving pharmaceutical companies, and mercury poisoning, though she doesn't profess to be a regular newspaper reader. She said she's not against vaccinations, but would opt for the safest vaccines possible. "I'm sure I'll be condemned by the Public Health Service and people for scaring people off of vaccinations. And I don't want to do that. I just want people to be aware of the possible side effects," Moorman said. "We are fortunate in California that in California you can have a choice for philosophical or religious reasons to opt out of one or two or all of the vaccines. I certainly don't recommend that, but I think people should have the choice." The number of whooping cough cases in SLO county has gone up from just one in 2002 to 110 in 2005 and 75 in 2006. What's more, two cases were found at French Hospital in late March and one was a labor and delivery room nurse. Whooping cough is most harmful to young children and especially infants. An article in the Journal of the American Medical Association from October 2006 published the results of a study showing states that have personal belief exemptions and states that make it easy to obtain an exemption have higher rates of pertussis, or whooping cough. The journal recommended, "States should examine their exemption policies to ensure control of pertussis and other vaccine-preventable diseases." California is one of 19 states that allow personal belief exemptions. In order to exercise this exemption, a parent or guardian must sign a statement on the reverse of their child's California School Immunization Record. The California form is straightforward and, unlike some other states' versions, doesn't require the parent to list a religious reason for the choice, only to affirm that "all or some immunizations are contrary to my beliefs." The form notes that the child, for his or her own protection, may be temporarily excluded from school in the event of an outbreak of one of the diseases. According to the CDC, when other countries have seen drops in vaccination rates, spikes in pertussis cases have followed. Trinidade pointed out another problem with relying on other people getting vaccinations. Although vaccines have been nearly miraculous in eradicating the diseases they fight in the United States if not the Western Hemisphere many of those diseases are still prevalent in other parts of the world. In China, 10 percent of the population has chronic Hepatitis B. That's 130 million people. That and other diseases are as close as an airplane flight away in this so-called global village. For instance, the only cases of measles in California last year were imported. One was an infant adopted from China and another was a missionary who had gone to Africa without being immunized. Still other vaccine-preventable diseases are even closer to home. Judy Piper, a coordinator at Coastal Medical Research in San Luis Obispo, explained why doctors always want their patients to get tetanus shots. "You don't want to come down with lock jaw if you come into contact with a rusty nail if you work in a garden," she said. Vaccinations themselves are never 100 percent effective even if everyone had their children immunized, a small percentage would remain at risk. Also, Trinidade argues that the laws regulating vaccine approval are so rigorous that it's safer to be vaccinated than to risk being exposed to disease. Each vaccination up for approval must be reviewed by a group of scientists and doctors not affiliated with any vaccine manufacturer, who must then submit a study of the vaccine to the Food and Drug Administration. "If there is something in this study that says this vaccine will cause a serious side effect, it won't get approved. America won't tolerate that," Trinidade said. As a further precaution, physicians screen parents before vaccinating their children by asking seven basic questions about the child's health and previous reactions to immunizations. However, Darya Boland, a doctor of naturopathic medicine at the Advanced Alternative Medical Center in Atascadero, doesn't think the risks are always explained. "I think people should be aware. The risks should be explained and whether or not there are any alternatives to that treatment. And a lot of times that never happens," she said. Boland granted that there are no natural alternatives to vaccinations. She said, however, that nutrition, sanitation, and breastfeeding can help prevent infections in infants. Kim recalls a perfect delivery with Karsen. She says he was an easygoing baby, always happy and laughing. He's still quite humorous and affectionate. "He's very flirtatious. He definitely knows what women are and he loves women. The blonder the better," Kim said. Like any toddler, Karsen loves the toys he's not supposed to play with. He turns on the television, calls up every number on his mother's phone, and pushes the delete button on digital cameras. It's all an exploration to him. He also knows the classic nursery rhyme songs like "Old McDonald Had a Farm," to which he eagerly makes all the farm animal sounds. 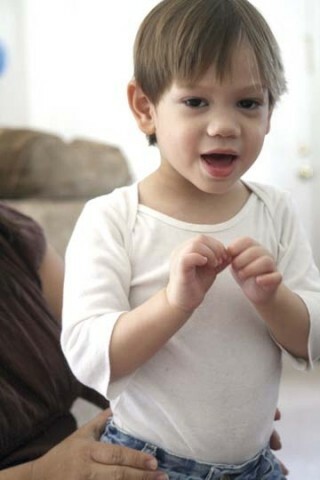 He's learning sign language and enjoys books more than Teletubbies or Sesame Street. But always, there are the seizures. "On a good day, we are probably right at a hundred on a really good day," Kim said. Not all of the seizures are very serious, but they are still damaging to his brain. Because of this, Kim doesn't think her son will ever be able to live completely on his own. Like Moorman, Kim said she wants safer immunizations rather than none at all. Her advice to other parents would be to educate themselves about immunizations and their side effects. The truth, Waters acknowledged, is that she's counting on everyone else immunizing their children so hers will be safe without the vaccines. Waters, though, hopes to soon start a support group for parents like her parents who want control over their children's medical care. And, just maybe, a few more answers. Intern Lauren Zahner can be reached through the editor at rmiller@newtimesslo.com.